Looking to add a special touch of fun for your Summer Camp? 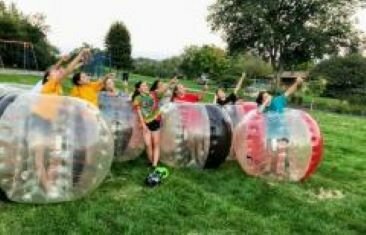 Knockerball Bubble Soccer is a great way to get everyone involved and laughs are guaranteed. We can play indoors on a basketball court or outdoors on grass/turf. We are full service provider with the safest equipment available and we are fully licensed and insured. We have various size bubble suits to ensure participants safety. We have been featured on ESPN, WGN, Good Morning America and 190 North. We are also proudly featured in a few local School Event Days and the Chicago Park Districts Summer camps as well as. Our staff will arrive 30 minutes prior to set up, briefly instruct players and then referee all games. Let the laughs begin! SAVE when booking more then 1 main event! Call/email for pricing and we will customize a package for your Summer Camp - Let us Bring the Party to You!